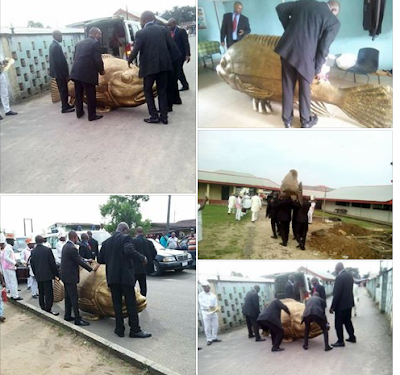 Residents of Uyo, Akwa Ibom state, were amazed today to see a man laid to rest in a customized fish-shaped casket. Being an unusual incident in the area, the casket attracted huge attention from onlookers who couldn’t help but gather to experience the unusual scene. Some internet users who didn't understand the concept, took to social media to discuss about it. See their comments and more photos after the cut. 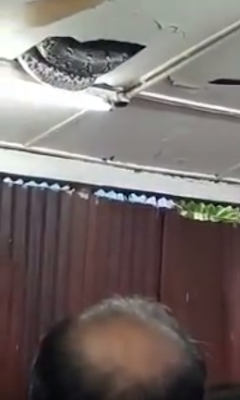 The happiness of a bride who was getting married at Mountain of Fire and Miracles Ministries (MFM) was almost cut short when she was instructed by MFM church officials to hack off her 'offending' hair. According to the social media user who was the official photographer at the wedding, the bride had attached human hair weave to her natural hair but she wasn't allowed to go further with the wedding until she cut off the entire thing and also wipe off her make up. Tanzanian singer, Alikiba, has lashed out at those who attacked Wizkid after MTV European Music Awards stripped Wizkid of his award of the Best African Act and gave it to Alikiba after polls revealed that Alikiba had higher number of votes in the said category than Wizkid. 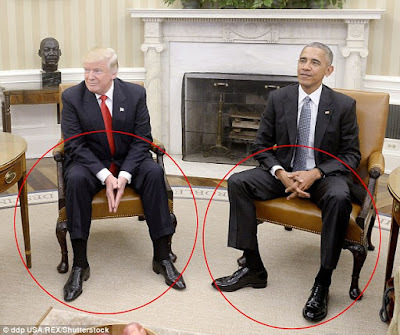 There was a social media war between the fans of Wizkid and Alikiba after Wizkid won the MTV European Music Awards, Best African Act that was later given to Ali Kiba.Reacting after some of his fans attacked Wizkid,Alikiba wrote..
President-elect Donald Trump said he will consider an 'amended' version of President Barack Obama's signature health care law - a softening of his position after repeatedly vowing on the campaign trail that he would repeal the measure. Trump explained in an interview with The Wall Street Journal published Friday that the shift came after White House talks Thursday with Obama, who asked him to consider preserving parts of the Affordable Care Act. 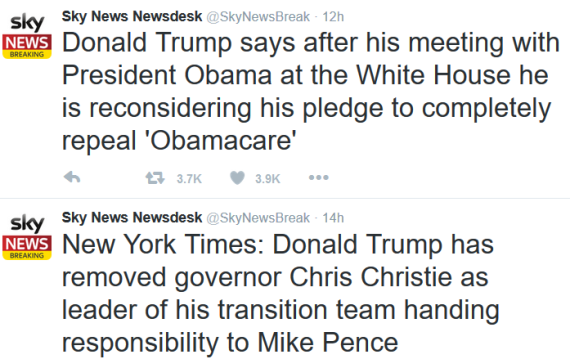 'Either Obamacare will be amended, or repealed and replaced,' Trump told the newspaper. 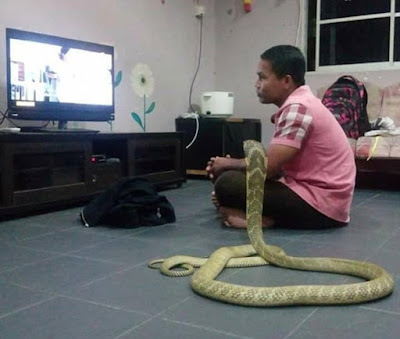 The snake was spotted by the man in South East Asia, who said it bore a 'striking resemblance' to his former lover. 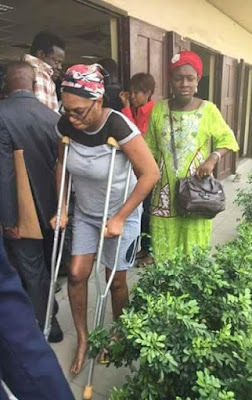 Domestic violence victim, Ivie Edobor arrived the Magistrate Court, Surulere, on November 10th, where her estranged husband is on trial for assaulting her. 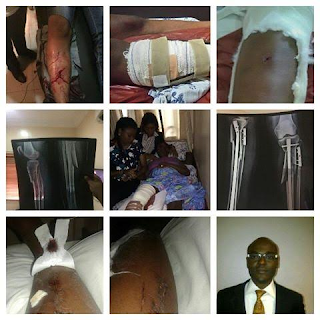 The mother of three was brutally attacked by her husband, John Edobor last September, following their failed marriage. 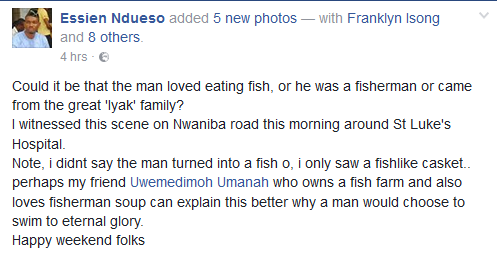 Dear friend, To shed more light on my ordeal, this is my story. Two years ago my husband kick me out of his house along with my 3 daughters ages 9, 7 and 4. I was forced to move back to my father's house and struggled to provide for my 3 children as he completely neglected them and even took them of his medical insurance provided by his office Zenith Bank Plc. The rabble of medieval English county families baying for broken glass pales in comparison with the rancour currently tearing at the heart of Mohammed Babangida, scion of former military president, Ibrahim Babangida dynasty. Since his marriage with Rahma hit the rocks, he has known no peace. Having suffered the action and counteraction that projects the reciprocal struggle of discordant feelings in wedlock, Mohammed was devastated to see his marriage crash to the disharmony that resulted from his protracted marital blues with Rahma, the daughter of billionaire businessman, Mohammed Indimi. Although the sordid details of their relationship was an open secret in high society circles, Mohammed, his family and friends tried to keep the news as a closely guarded secret. Two female suicide bombers were blown into pieces as they tried to attack a military base while another was shot dead by the army before she could detonate an IED. A newborn baby boy has been found alive in a dumpster on the Claflin University campus in South Carolina and now police are charging his 19-year-old mother with attempted murder. Claflin student Amber Brianna Fulton, of Kingstree, has also been charged with illegal contact towards a child. Her son, less than five hours old, was discovered in the trash by custodians at around 8.55am on Wednesday. The Orangeburg Department of Public Safety stated that university employees were disposing of trash collected from a dormitory when they heard the sound of a baby crying coming from the dumpster on Goff Avenue, reported The Tand D.
They peered into the bin and found the newborn stuffed inside a trash bag. He was not wearing any clothes or a diaper. The importance of Agriculture to the economy cannot be quantified more especially in the present economic crunch where all other sources of revenue have dwindled. Besides, agriculture is the only dependable activity that could guarantee food security apart from its economic benefits, hence, the federal government saw the need to diversify the economy with much priority to agriculture. 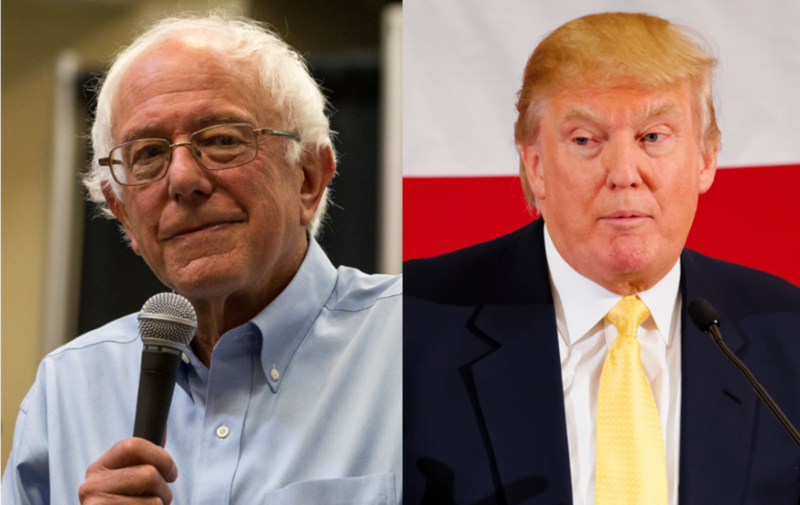 'Unless The Democrats Run Sanders, A Trump Nomination Means A Trump Presidency' - A PhD Student At Harvard University Published This In February! Wth Donald Trump looking increasingly likely to actually be the Republican nominee for President, it’s long past time for the Democrats to start working on a pragmatic strategy to defeat him. Months of complacent, wishful insistences that Trump will disappear have proven false, and with a firm commanding lead in polls and several major primary victories, predictions are increasingly favoring Trump to win the nomination. If Democrats honestly believe, as they say they do, that Trump poses a serious threat to the wellbeing of the country and the lives of minority citizens, that means doing everything possible to keep him out of office. 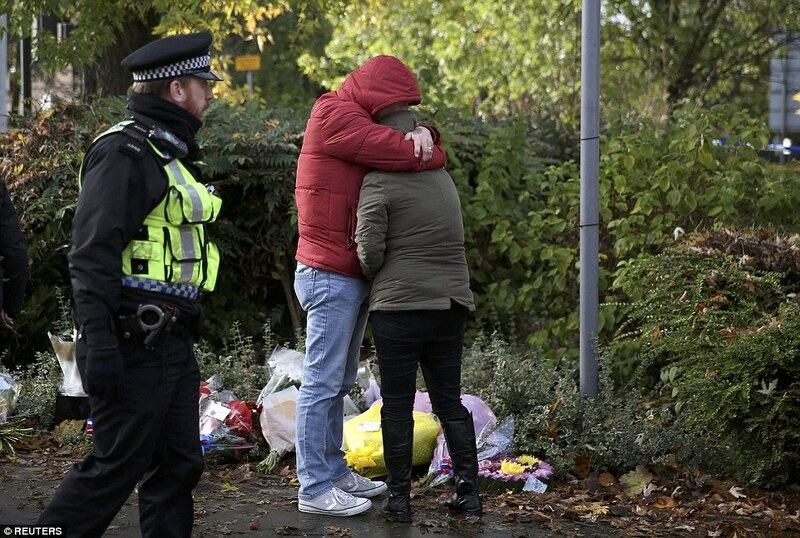 Tearful mourners have left tributes at the site of a tram disaster that killed at least seven people and injured 50 more. Dozens of flowers have been laid near Sandilands tram stop in Croydon where the two-carriage vehicle derailed and overturned early yesterday morning. It comes as the first victim of the Croydon tram disaster was named locally as 19-year-old Dane Chinnery, a local labourer and Crystal Palace fan who was described as 'lovely, caring and beautiful' on social media. Imagine having a tasty meal and an unexpected guest literally drops in on you. That was the experience of diners in a restaurant of uncertain location. 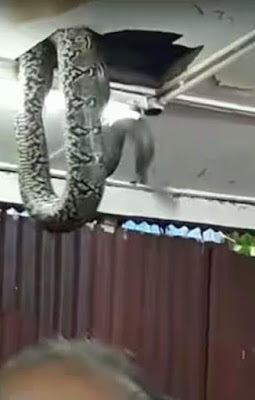 They were having their meals when a large snake which appears to be a python dropped from the roof sending them scampering away in different directions. A lady identified as Witness had her throat slashed last night by her boyfriend in Adamawa state. 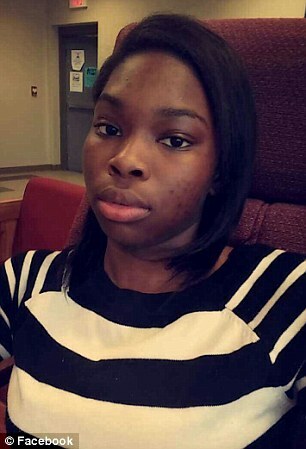 The victim who was identified as Witness is a student of the Adamawa state Polytechnic, Yola campus. 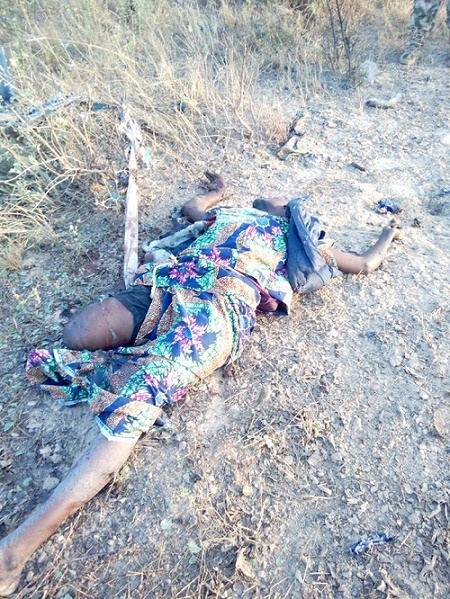 She was quickly rushed to the specialist hospital Yola by her fellow female students of the State Poly with her throat slit with knife and other wounds over her face and body. Who says Nigerian men aren't romantic? 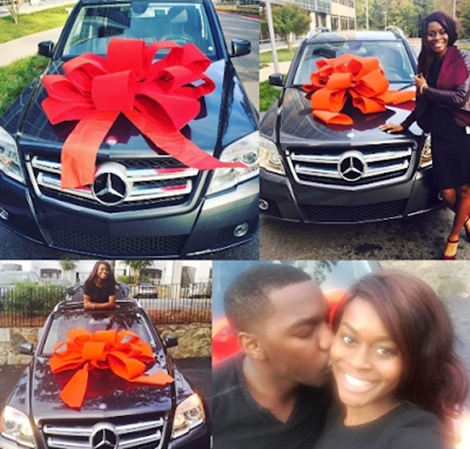 A woman has heaped praises on her man who just gifted her a brand new luxurious Mercedes Benz car. "When you have a man of God who values your worth .... When you have a man who courted you first.... When you have a man who decided to make you his wife.... That's my man...My Fiance... My Husband God, I thank you. Donald Trump's triumph has been compared to the September 11 terrorist attacks by some people who are furious with the election result. 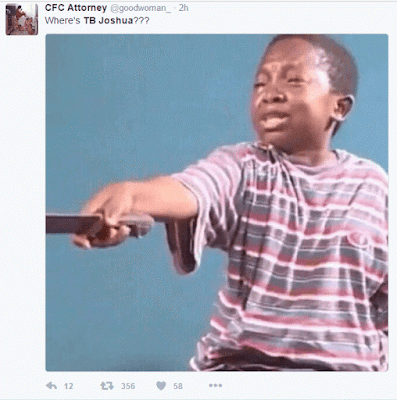 Shortly after the Donald defeated Hillary Clinton to become President-elect, social media users began pointing out the symmetry in the dates on which the two incidents took place. 'On 9/11 a war began. On 11/9 that war ended. The terrorists won. 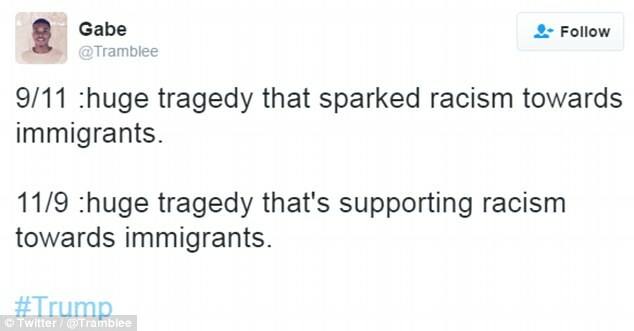 Our country is now more like theirs,' writer Joshua Fialkov tweeted. Throngs of demonstrators marched in cities across the United States on Wednesday to protest against Republican Donald Trump's surprise U.S. presidential election win, blasting his controversial campaign rhetoric about immigrants, Muslims and other groups. In New York, thousands of protesters filled streets in midtown Manhattan as they made their way to Trump Tower, Trump's gilded home on Fifth Avenue. Hundreds of others gathered at a Manhattan park and shouted "Not my president." The most diplomatic remark one can make about Donald Trump is that he’s ‘eccentric’. The love-me-or-hate-me-but-you-just-can’t-ignore-me-statement doesn’t apply more appropriately to anyone else. Now, we sure as hell cannot be ignoring him. There are a lot of things Trump is known for, but here are a few facts that you just may not know. What you do with them – be scandalised, be angered, or be entertained – is entirely up to you. At the age of 13, Trump was sent to the New York Military Academy (NYMA) due to behavioural problems in his previous school. His parents believed that a little discipline would fix the conduct of this “pretty rough” defiant young fellow. Once there, however, he earned the title of “a loudmouth bully,” as some of its residents recalled. When Dylan Little was born four years ago, his mother Kara and the medical staff were bewildered, Dylan's entire back was covered with a massive dark mark. His legs and arms were also covered with sizeable birthmarks. The neonatal ICU quickly discovered that Dylan had been born with a rare skin disorder called congenital melanocytic nevus. Justice Rita Ofili-Ajumogobia took agents of the Economic and Financial Crimes Commission (EFCC) on a wild goose chase as she traveled with them from Lagos to Benin and Asaba in search of properties she claimed her late mother bequeathed to her. However, the search was futile as the judge was unable to show agents the said properties she allegedly inherited from her mother. 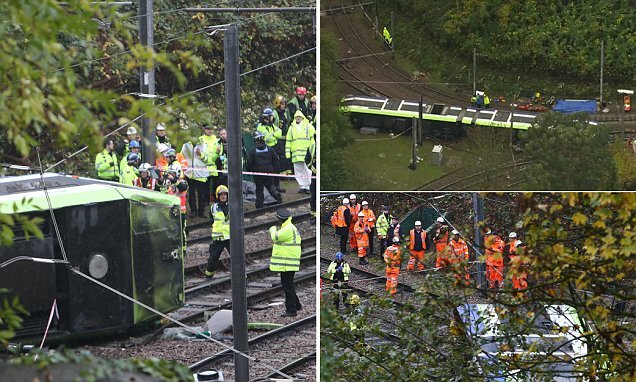 Eight people are feared dead and 50 more have been injured after a tram derailed and overturned in London this morning. Witnesses said they heard a loud crash at around 6am when the two-carriage vehicle came off the rails amid torrential rain. Residents said the vehicle was coming down a bend on a steep slope and 'carried on down the hill rather than turning', with fears it may have been going 'too fast' and tipped over near a tunnel. 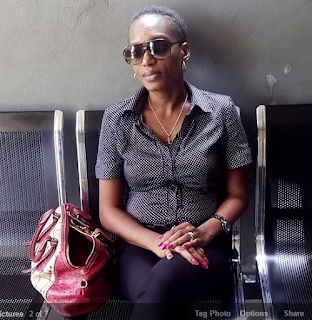 Annie Idibia and Tuface’s babymama, Sumbo Adeoye keep setting commendable examples for women out there. In preparation for her birthday, Annie teamed up with a couple of entrepreneurs yesterday to empower women in Lagos through her Annie Idibia Care Foundation which she launched this month. The empowerment initiative,which saw a turnout of numerous women, had classes and trainings in different entrepreneurial fields such as Bag making, cake making and event planning. 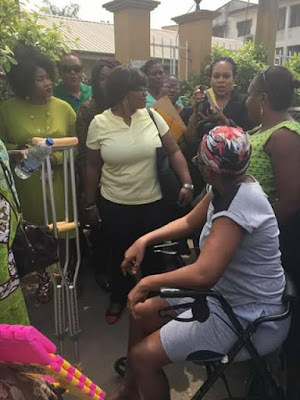 Sumbo Adeoye, who is a pastor and also an events planner, was one of the facilitators at the program, shutting down rumours that there might be beef between herself and Annie. 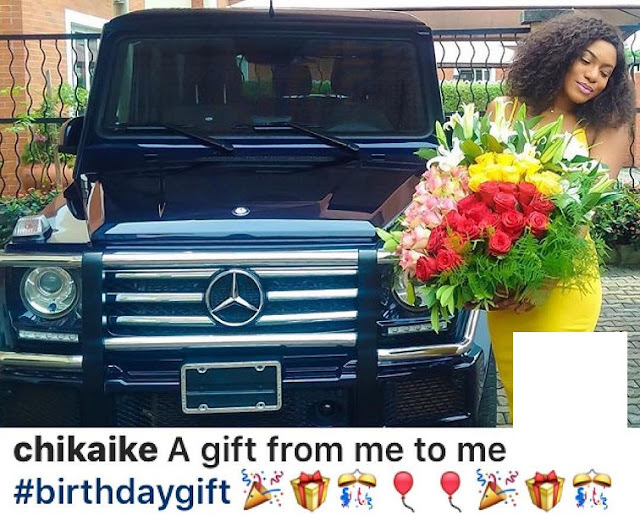 Honourable Maria Ude Nwachi popularly called Afikpo chic is catching serious flak for the open letter she penned to popular blogger, Linda Ikeji via her Facebook page last night about compromising her standards when it comes to issues of relationship and settling down. Her letter was in response to an interview the latter had previously granted. Linda Ikeji, in the said interview, had stated that she could not marry a poor man among other things and the lawmaker tore into Ikeji saying her statements were unreasonable and portrayed a lack of emotional intelligence. 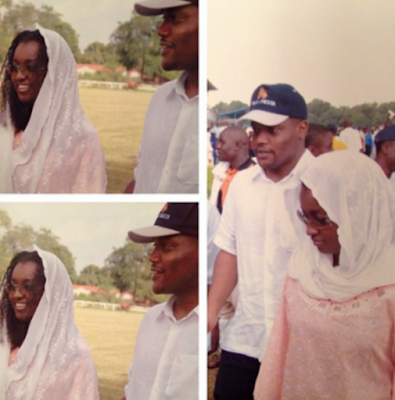 She proceeded to advise her to be mindful of her utterances given that she is a public figure. Lagos State Governor, Mr. Akinwunmi Ambode restated his administration’s commitment to ensure that the Blue Line of the Light Rail Project is up and running by December 2016. He said by this December, the project will start running. So, work is seriously ongoing,” Governor Ambode assured. Prophet TB Joshua had declared that Hillary Clinton will win the American presidential election in a ‘narrow victory’ against her Republican rival Donald Trump. 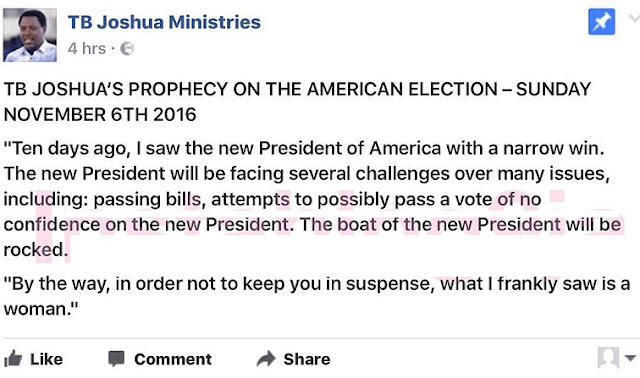 6th November 2016, a service broadcast live to millions more on the popular Christian channel Emmanuel TV, Joshua said he saw the outcome in a ‘vision’ 10 days ago. "Thank you. Thank you very much, everyone. Sorry to keep you waiting. Complicated business, complicated. Thank you very much. over a long period of time, and we owe her a major debt of gratitude for her service to our country. The Republican has sensationally won the White House - taking Pennsylvania to secure 274 electoral college votes in a humiliating defeat for Hillary Clinton. But as the 70-year-old's supporters prepared to celebrate the victory, shocked Twitter users took the opportunity to poke fun at the situation. 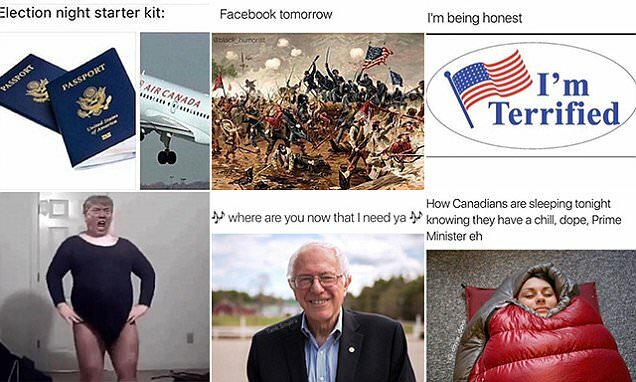 One showed a picture of the one-time Democrat hopeful Bernie Saunders along with the words 'Where are you now that I need you' - lyrics from a Justin Bieber hit. Another, showing an Air Canada jet taking off alongside two passports came along with the caption: 'Election night starter kit'. 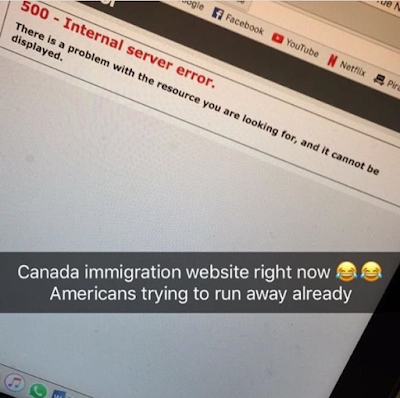 The Canadian immigration site has broken as people look to leave the US in the immediate aftermath of Donald Trump's election as the country's new president. The official website for 'Citizenship and Immigration Canada' has stopped working, apparently because of the sheer number of people looking to emigrate to the country from south of the border. All of the Trump clan, including his sons Eric, Donald Jr and Barron, daughters Ivanka and Tiffany (bottom left), wife Melania and running mate Mike Pence gathered in their war room as the results came in. Eric and his wife Lara (bottom right) celebrated their two-year anniversary Tuesday night. 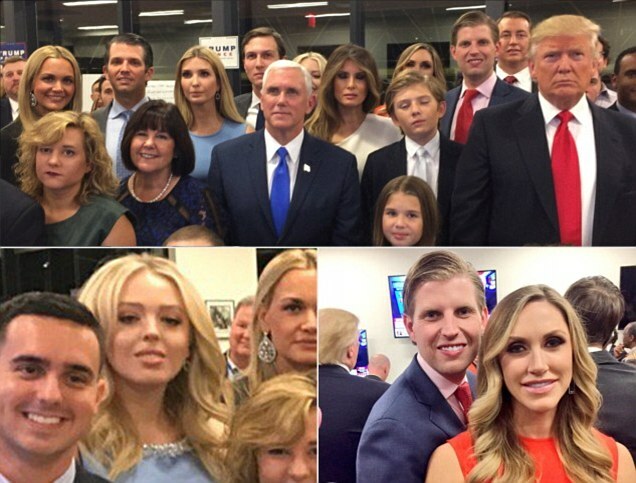 Three generations of Trumps were represented as Donald Jr's daughter Kai posed for a group picture with the rest of the family (she is pictured, top, next to Trump). Barron (pictured on the second row, second from right), Trump's 10-year-old son with Melania, made a rare appearance in the war room Tuesday night. Mr. Man, My Face Is Not On My Chest!!"